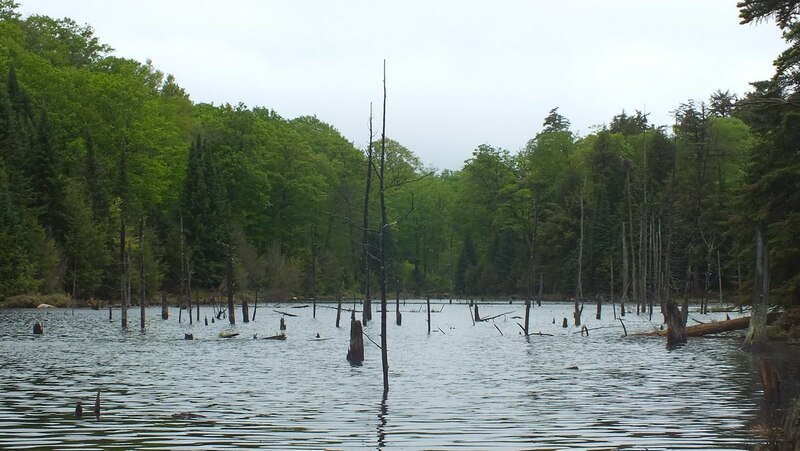 During the third week of May one spring, Bob and I found ourselves in the community of Oxtongue Lake, in Ontario, Canada. 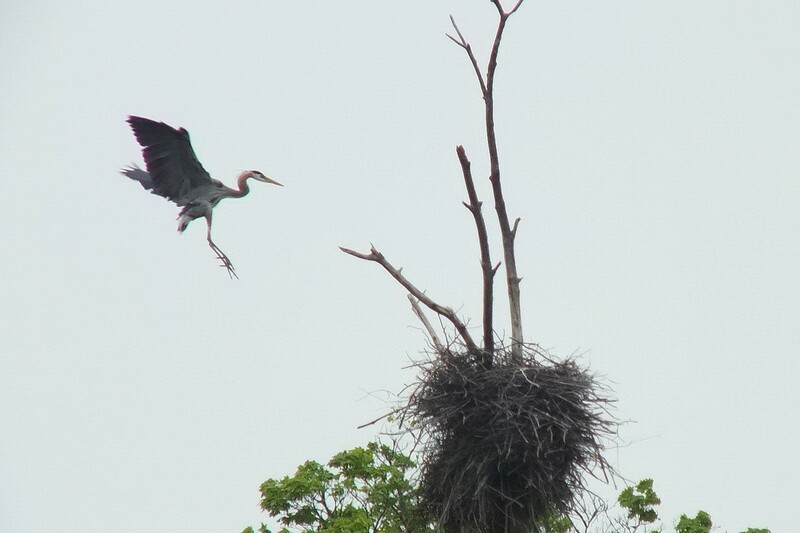 One of our objectives was to visit the Rookery where Great Blue Herons (Ardea herodias) have nested in past years. 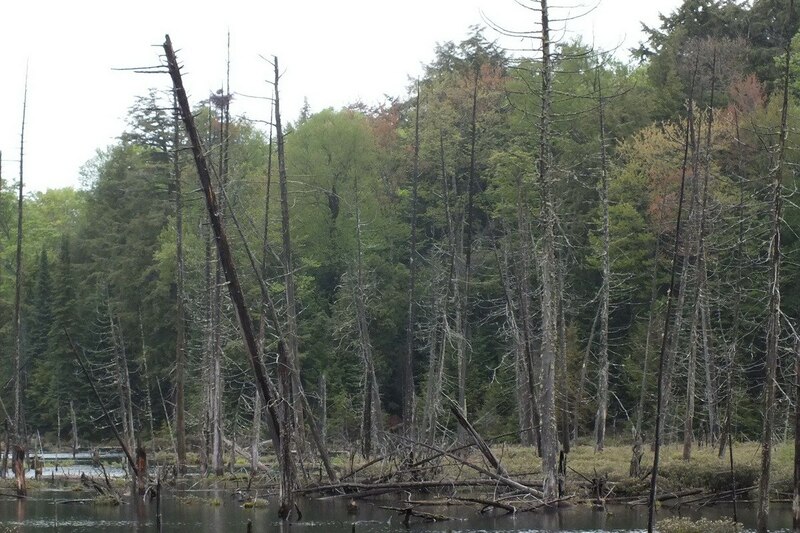 When we first broke through the forest that surrounds the beaver pond, we saw only vacant nests. 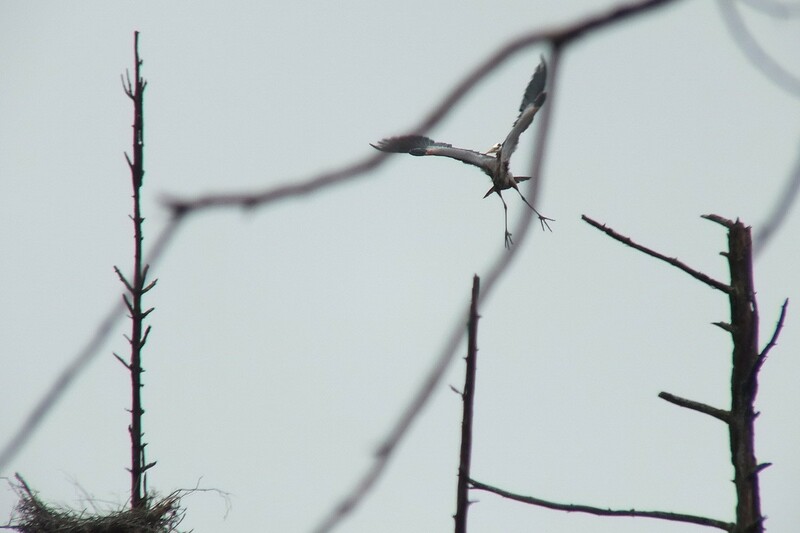 It wasn’t long before one of the majestic herons flew in and landed on its nest. Bob and I set out early on a very damp morning. 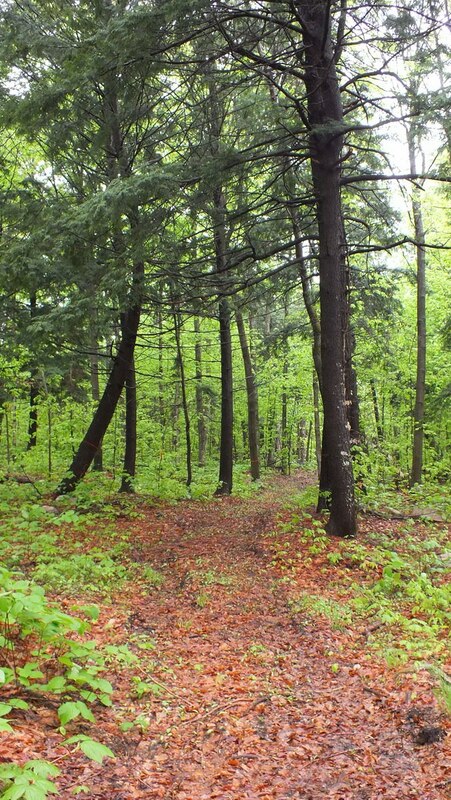 It had been raining for most of the previous 3 days, so the ground was saturated as we entered the woods on the Beetle Lake Trail, which begins near the Algonquin Outfitters store on Oxtongue Lake. With dim sunlight illuminating the forest, the understory literally glowed with new vibrant green spring growth. 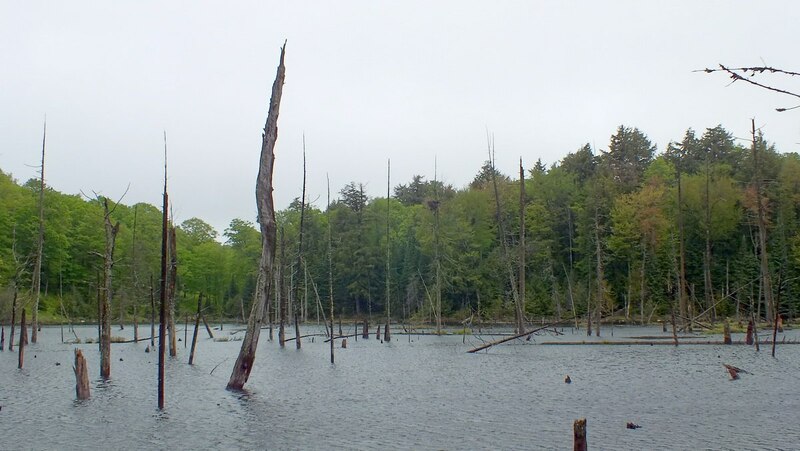 We hiked along the trail for about 2 kilometers before branching off towards the beaver pond where the herons had built their aeries. Our footsteps were silenced by the thick layer of wet leaves covering the trail, remnants from last autumn’s wonderful display of fall colour, so our movements drew no attention from wildlife. When Bob and I caught our first sight of the remote pond, it seemed very desolate, and it appeared that no herons had yet returned to the rookery. While I waited for something to happen, the wind was whistling through the trees, and I heard in the distance the screech of a lone Blue Jay. Even as Bob spotted a beaver just before it dipped below the surface of the pond, I caught sight of some bird life at the far end of the swamp. It was the flash of white in otherwise grey surroundings that drew my attention. 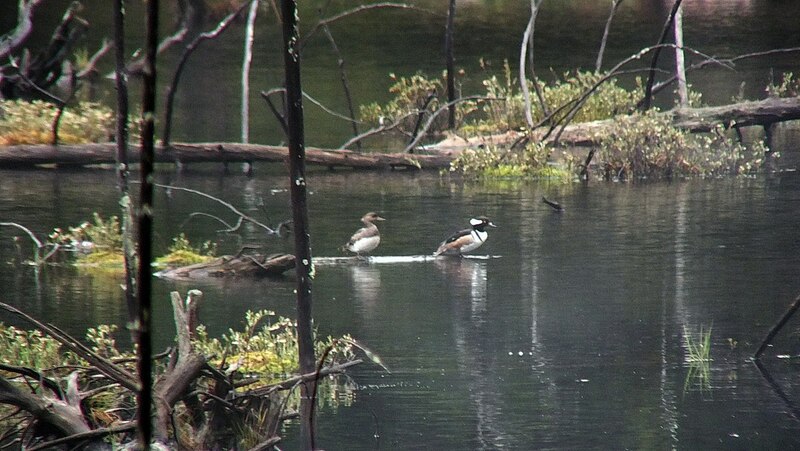 It turned out that the beaver pond was host to two Hooded Mergansers (Lophodytes cucullatus). We had actually seen a pair on Oxtongue Lake a couple of weeks earlier and wondered if these two could be the same ducks. The adult male, seen on the right, is in full breeding plumage; the adult female stayed close to her mate. As I occupied myself trying to determine what species of ducks I was looking at, Bob scanned the swamp and dead trees for any sign of the herons. There are actually 3 nests on 3 separate snags in the center of the beaver pond, representing a fairly small colony of herons. 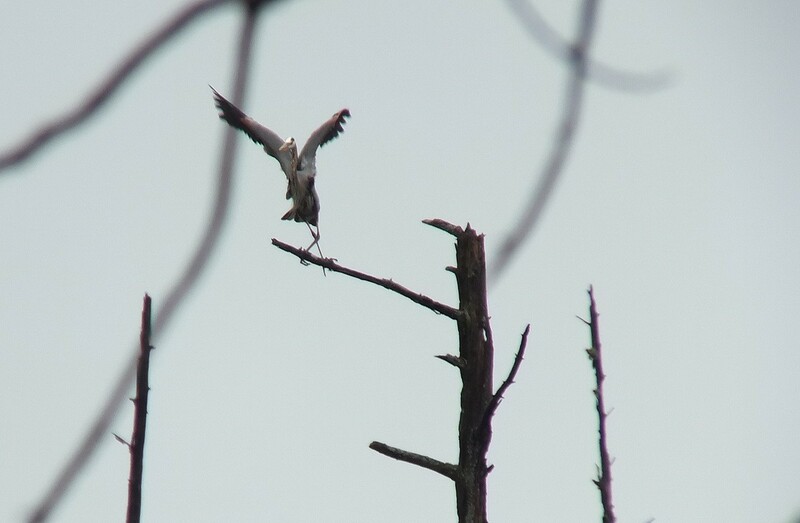 Despite the nests being so large, it was not easy to pick them out on such a dull day. At long last, Bob caught sight of some movement in one of the nests and promptly alerted me to the development. 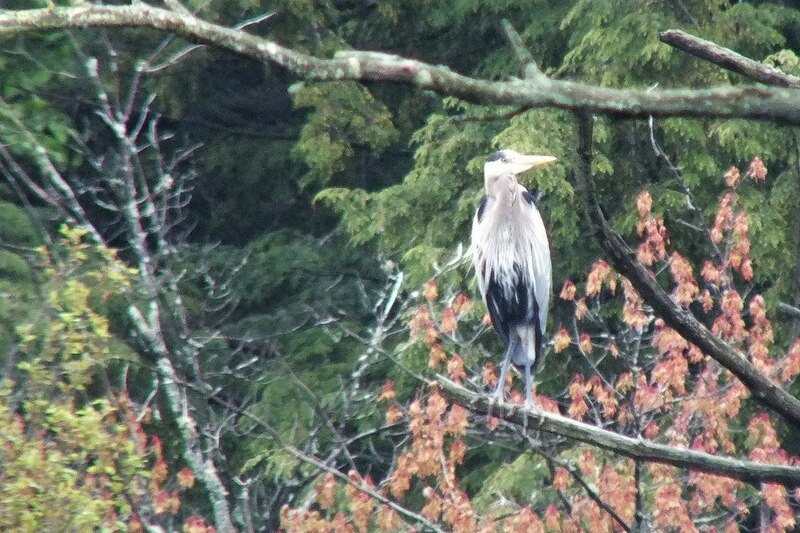 A Great Blue Heron had stood up to have a look around. 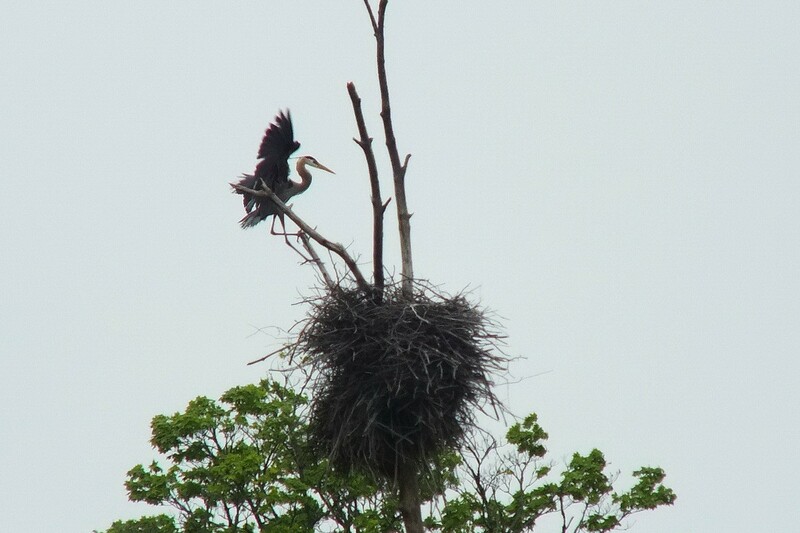 The Great Blue Heron then settled back down into its nest leaving only the head for us to see. 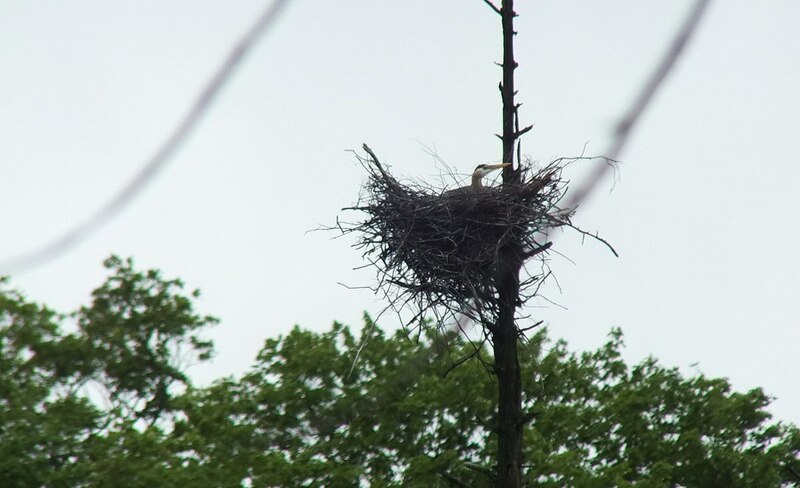 These, the largest herons in Canada, build a flattish structure of sticks for their nests, usually in the upper strata of tall trees. The nests are repaired and used in successive years. 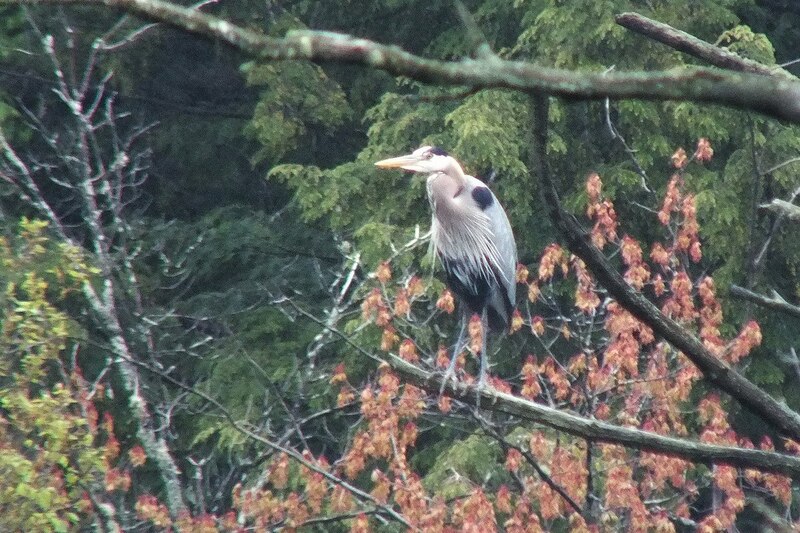 It was at about that time that Bob and I realized there was more than one Great Blue Heron on the scene. 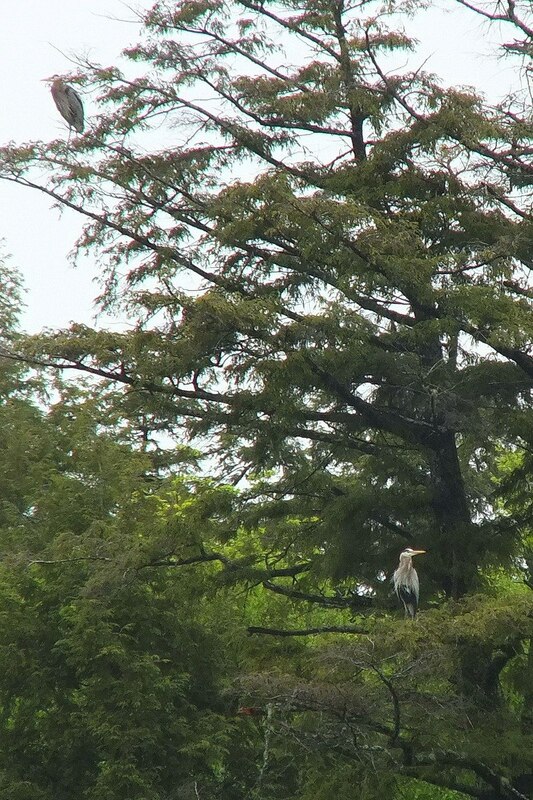 Perched on the uppermost branch of a tree on the far side of the swamp was a stately heron that remained in the treetop for an interminable length of time. We thought it would never move. Bob and I patiently watched and waited, hoping for more activity to unfold. 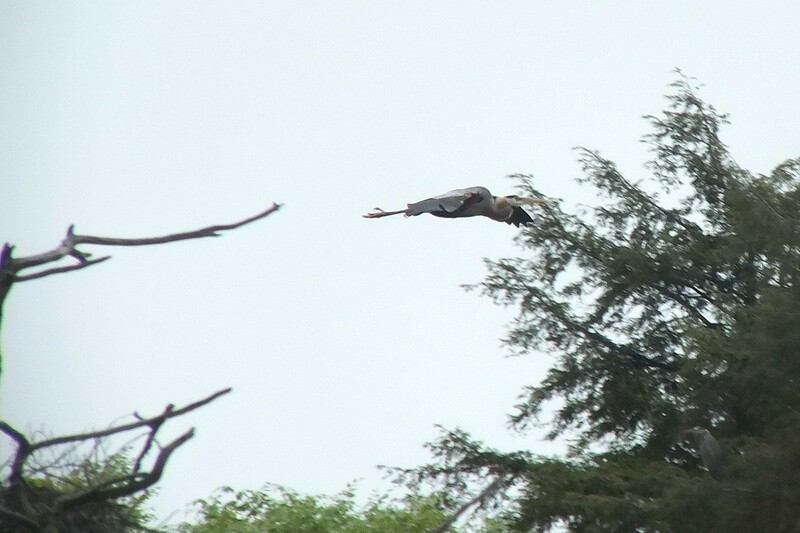 Finally, that heron launched itself into the air and swept along the treetops. We had our cameras poised and ready in the event that it came in for a landing. 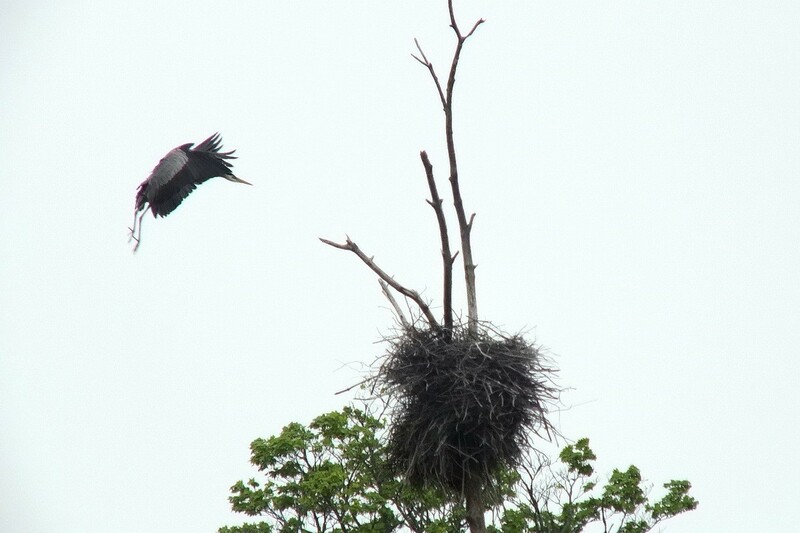 but had to quickly locate a second nest on which the heron apparently intended to land. I was thrilled with the resulting photographs. 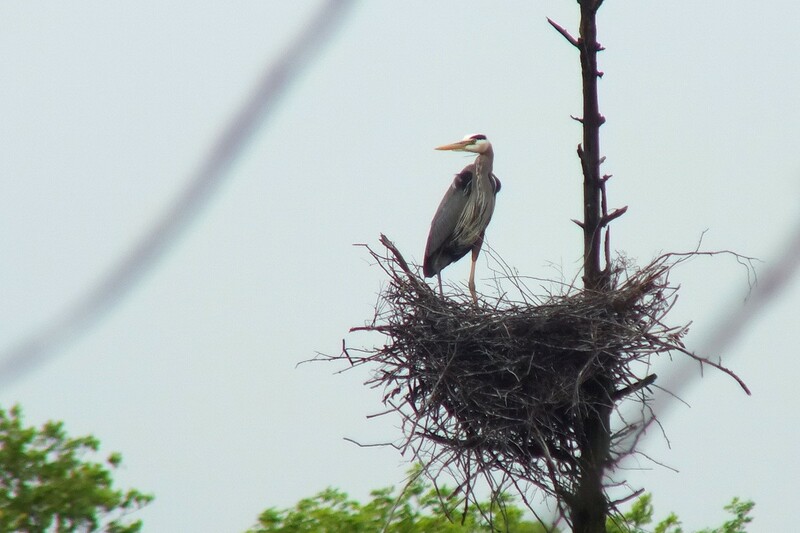 The gangly legs seemed so ungainly, but the heron had no problem settling amongst the trunks protruding from the top of the nest. 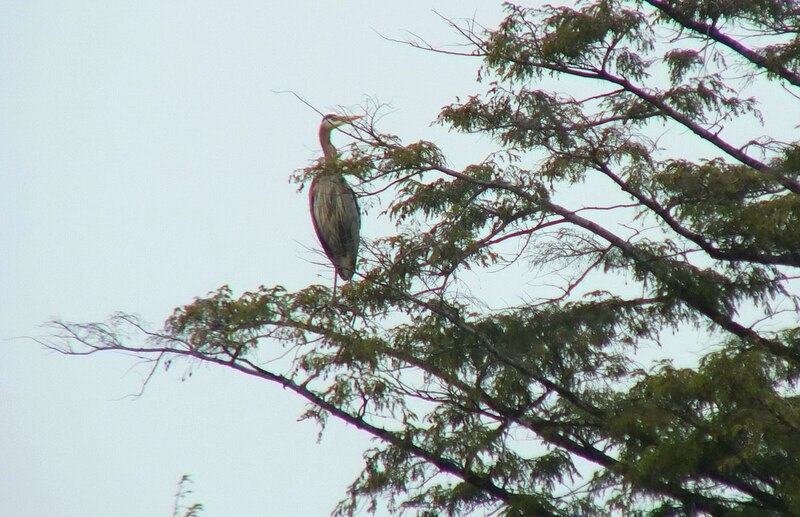 Over the course of 2 hours, Bob and I saw numerous herons circulate in the area. 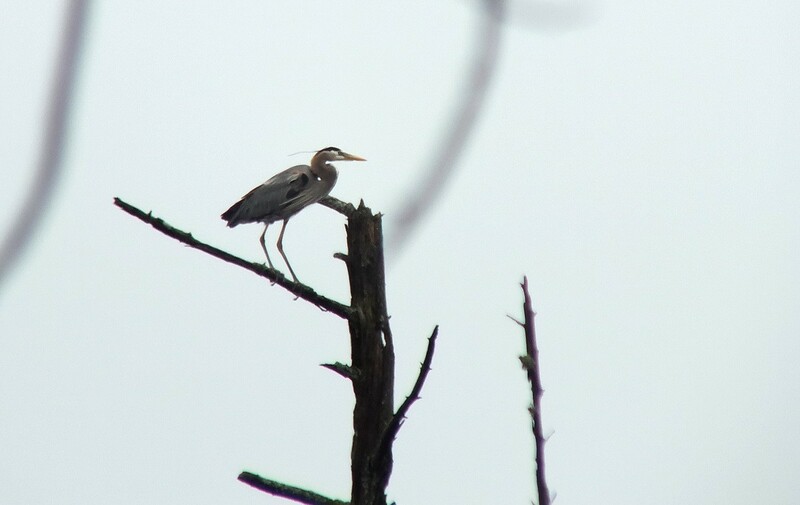 We actually were unable to determine how many individual herons there were. 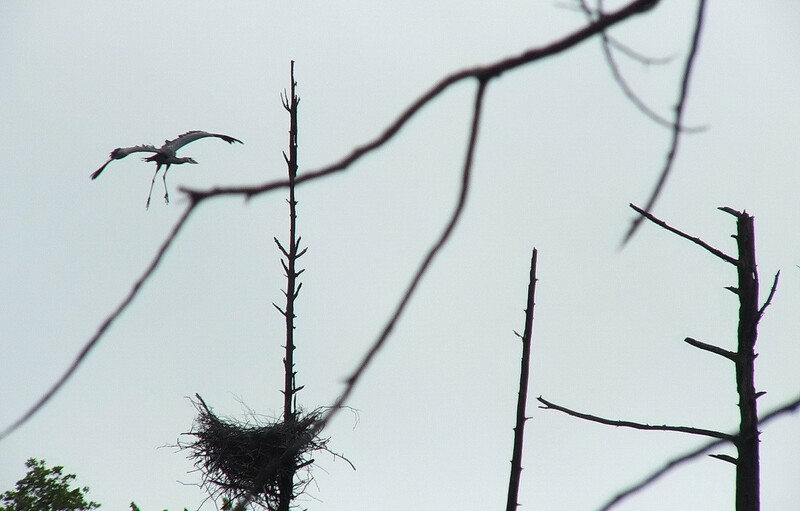 At one point, three of the birds were seen perched in trees on the shoreline. 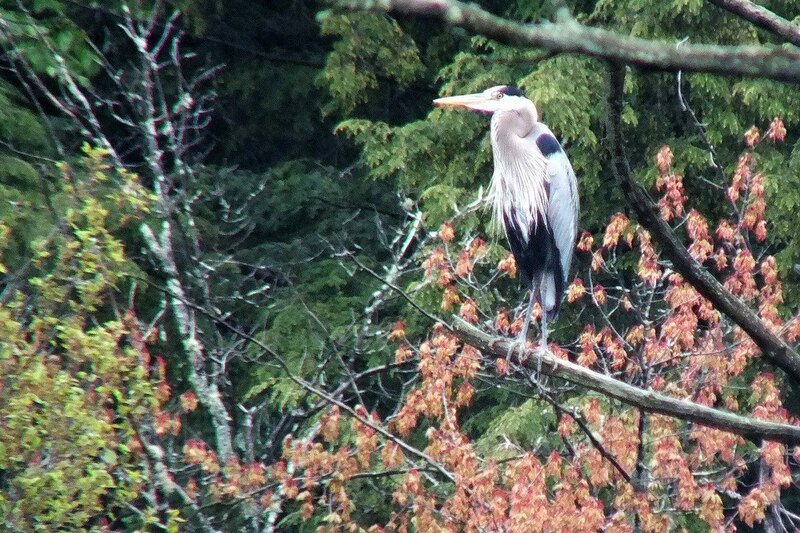 Great Blue Herons nest in either deciduous, coniferous, or mixed woodland, and there, around the beaver pond, was a good mix of deciduous and evergreen trees. 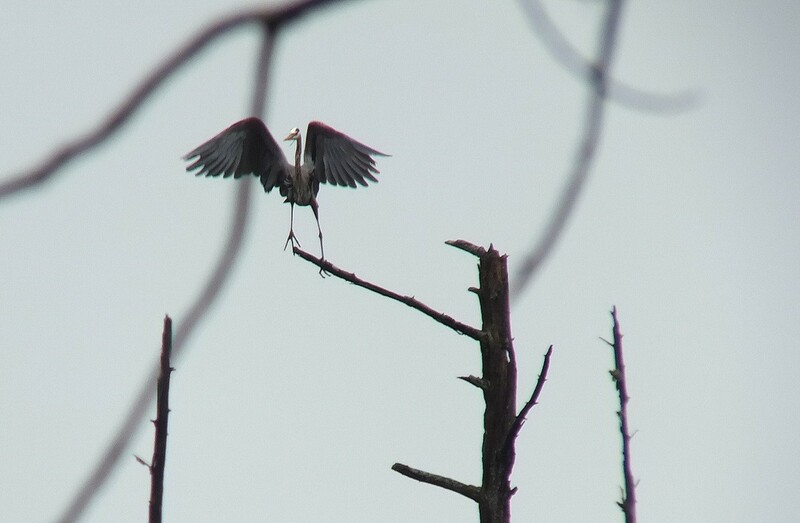 It was getting close to midday so we wondered if the increased activity meant that the herons were preparing to go in search of something to eat. Or perhaps they were returning to their aeries from an earlier foray. As Bob and I waited for the herons to get on the move again, we took the time to watch other bird species inhabiting the area. 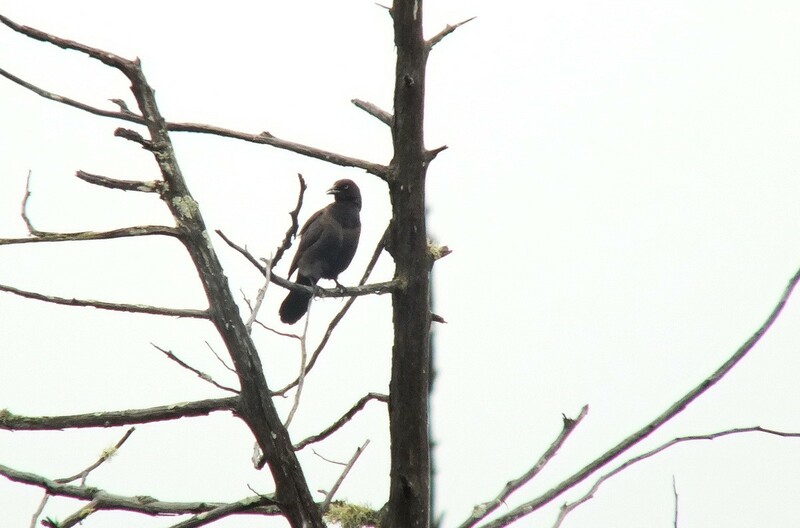 When a Rusty Blackbird (Euphagus carolinus) decided to rest for awhile on one bare branch, I couldn’t believe our luck. These birds are quite uncommon. Because the location was perfect…they prefer wet woods where pools of water stand on the ground, like in bogs and beaver ponds…it was no wonder that this blackbird had found the location ideal. 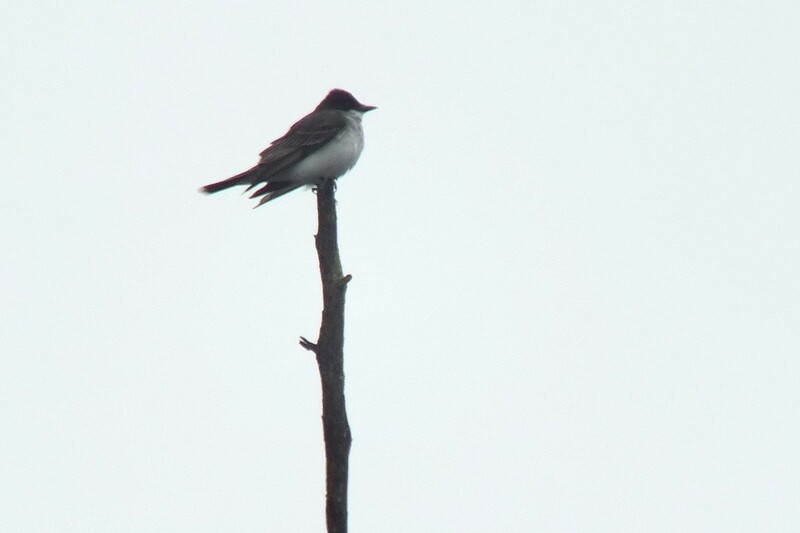 Not to be outdone, an Eastern Kingbird (Tyrannus tyrannus) assumed position on the blunt end of another long-dead tree trunk. 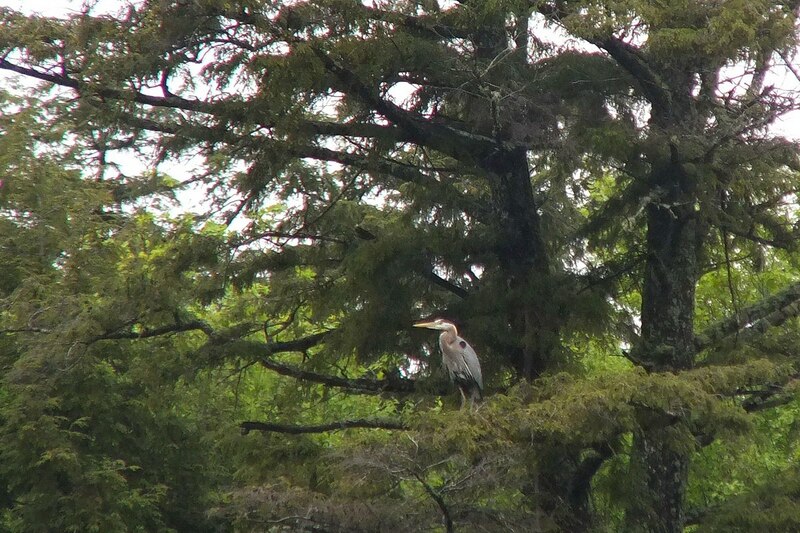 By that time, Bob and I had circled around the pond for a different perspective on the herons. When one of them moved onto the upper branch of the nest tree, we readied ourselves for the ensuing action. 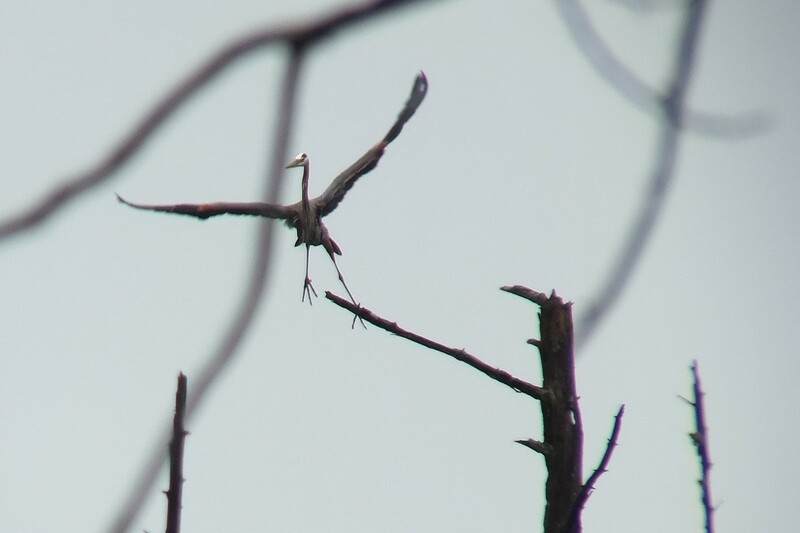 We were in awe when the Great Blue Heron performed a major contortion in order to launch itself into the air. 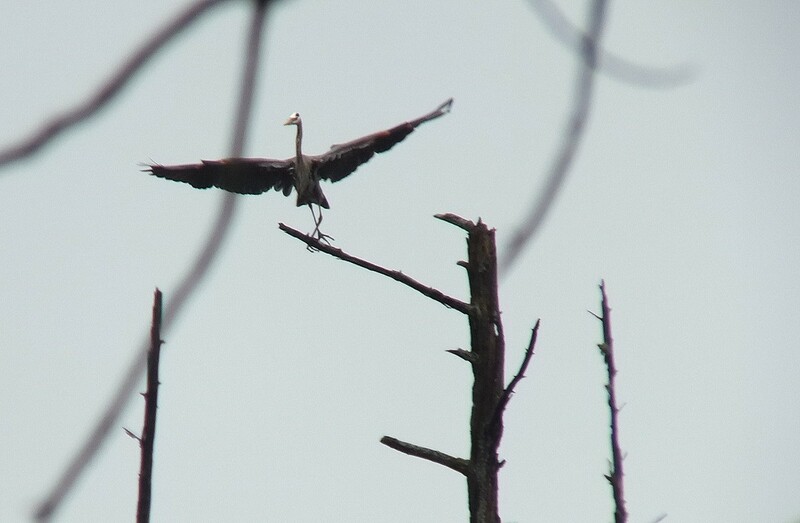 It seemed unnatural for the heron to twist its body and cross its legs simply to take flight. 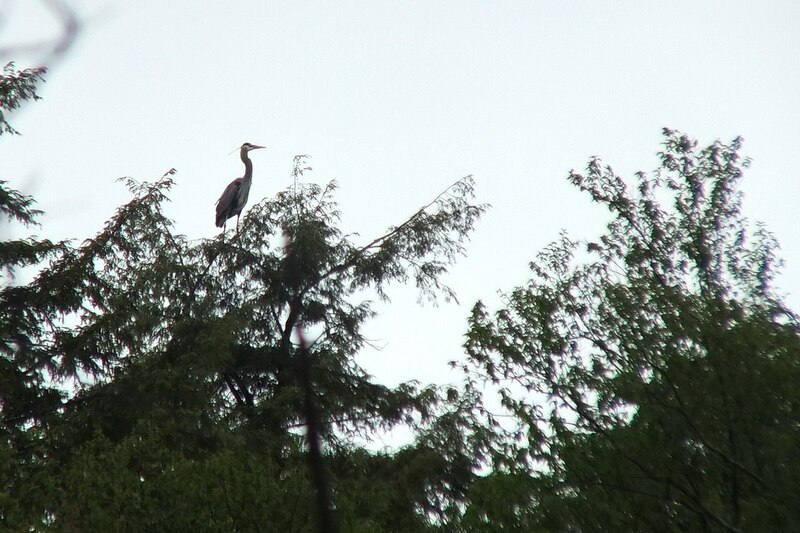 The heron didn’t go far, instead choosing to seek a vantage point from the edge of the forest. Again, the heron remained stationary for an awfully long time. Bob and I were chilled to the bone, and it was almost lunch time. On the heels of 30-degree weather a week earlier, the 5-degree Celsius temperature seemed downright wintry. Thankfully, owing to the cold temperatures and gusty wind, no blackflies or mosquitoes hassled us. With one last glance at the elegant heron in repose, we hastened to return home. 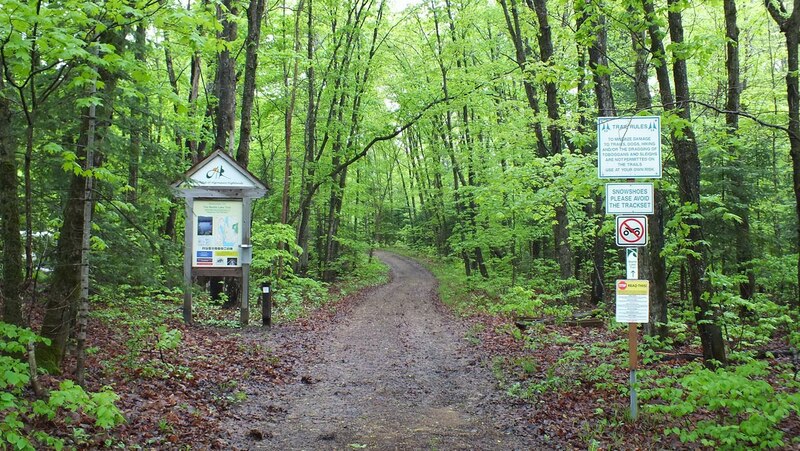 As cold rain drizzled down through the wind-whipped leaves, Bob and I loped along the forest trails, careful to avoid any missteps in the slippery, squishy mud. It had been a very worthwhile outing. 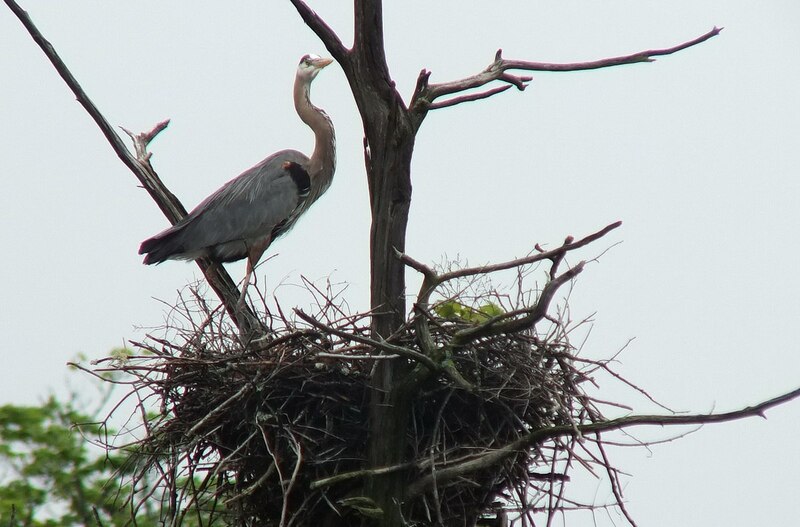 Great blue herons are very adaptable birds. They are found on every continent, except Antarctica. That’s quite amazing, isn’t it? I love these elegant looking birds.